So, for most of us, it’s just a week until our little humans start, or go back, to school. This year is Bill’s first year at school. If I close my eyes hard enough, I can see a newborn, tiny boy in my arms. And now the time has come to let him go and start to carve out his future. I’m in the process of checking his uniform, ironing on name tags, trying not to get too emotional, and thinking about school dinners. 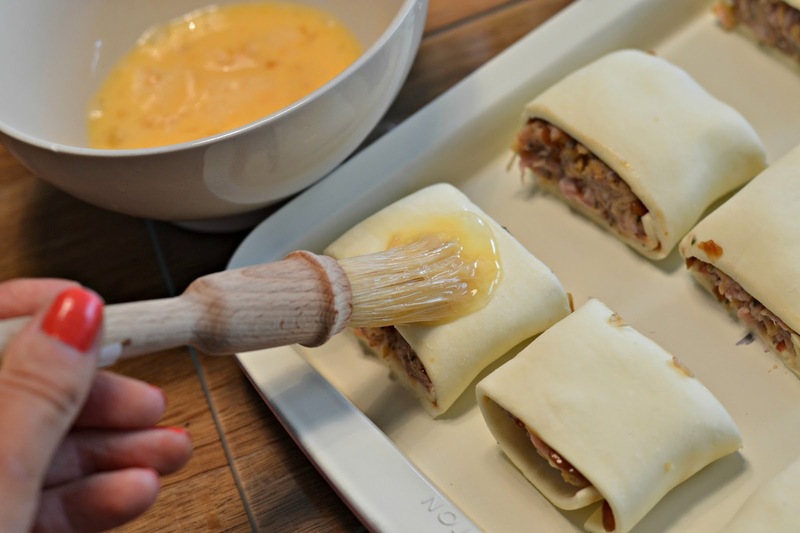 I’ve partnered up with Marigold to bring you this (pretty brilliant) Pork, Apple & Cheddar Sausage Rolls recipe. We made these on Sunday and they are already gone. They disappeared within the hour. They are savoury, with a hint of sweetness, and salty cheese. And they are perfect for school lunch boxes. You can even keep them in the freezer ready for the day where you forgot to buy bread! Plus – what I like about these is that sausages, cheese, dried herbs and apples aren’t exactly unusual ingredients. In fact, I always have those things in. 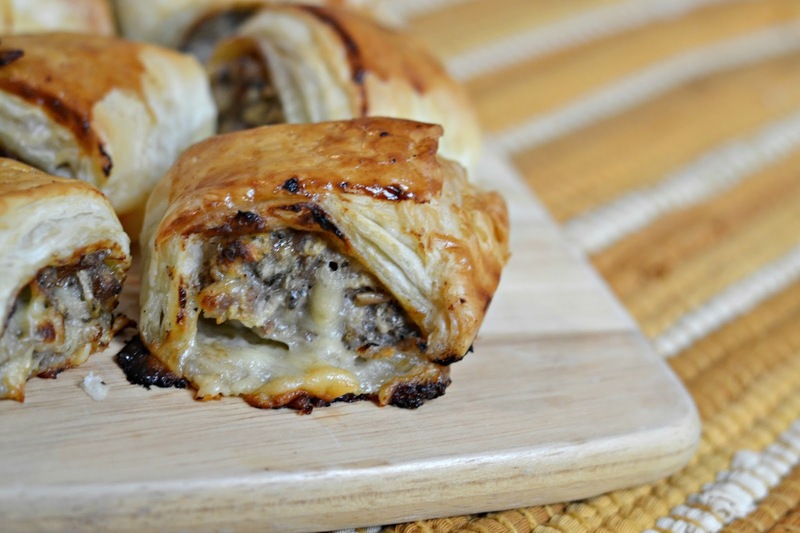 These sausage rolls are really easy to rustle up too. Minimal work required. Four large sausages (and by that I mean ones that aren’t chipolatas!). Three small apples, or two medium apples grated. 100g of cheddar cheese cut into small (say a centimetre) cubes. 1 teaspoon of dried sage. A pinch of salt and pepper (optional based on the age of your child). Two teaspoons of red onion chutney (optional but really good). A sheet of ready made puff pastry. Preheat your oven to 200°C. And grab a large baking tray. Depending on the type – mine was non-stick – line with some baking paper. Take a chopping board and a sharp knife, and cut your cheese into small cubes. Next take your apples and grate them as best as you can – leave the skin on, it’s good for you! Take your apple into clean hands and squeeze the juice out, either into a bowl to drink, or over the sink. Add both the cheese and apple into a large bowl. Take your sausages, and squeeze the sausage meat from your sausage casings, into the bowl too. Add the dried sage and seasoning (if using – small babies and children shouldn’t have too much salt) and then mix everything together with your hands. I like to use my Marigold Extra Safe Gloves (RRP £4.99 for a pack of 40) here, as they stop my hands from getting covered in sausage meat. Plus, they are 100% latex and powder free, they avoid lingering smells, allergies and contamination. Once you have mixed everything together. Combine into a large ball and then halve, ready for the next step. Take your puff pastry sheet, and place it horizontally in front of you, take a knife and split it in half vertically, so you have two equal sheets of pastry. This part is optional, but I then like to take a teaspoon of red onion chutney per each piece of pastry, and spread evenly in the centre of each one. Not only does this add an extra tangy sweetness, but it helps keep your pastry together too. 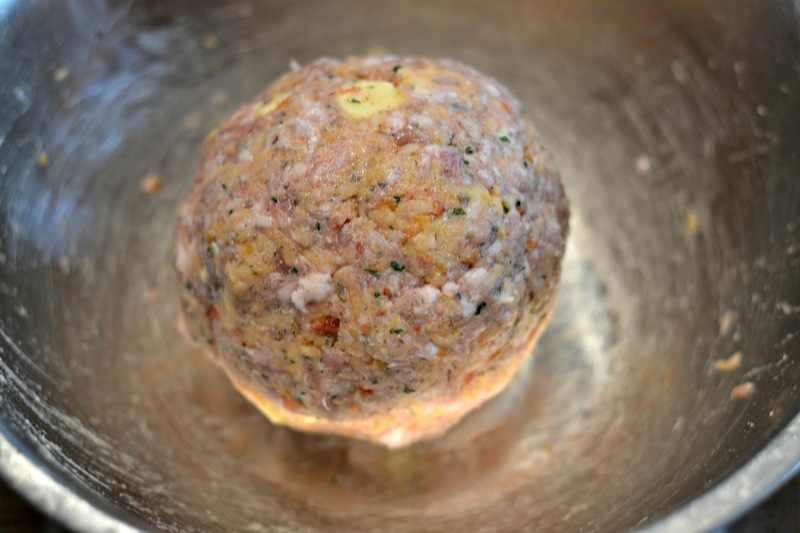 Now, you want to take half of your sausage mixture and mould into a long sausage shape. And lay that in the centre of one of your pastry halves. Do the same with the remainder of the sausage meat and the other half of pastry. And then, you just want to wrap that sausage meat in a bit of a pastry huge. I prefer to wrap in an overlap and gently press the fold with a fork to seal, rather than crimp on one side of the sausage roll, but the way you do this is up to you. 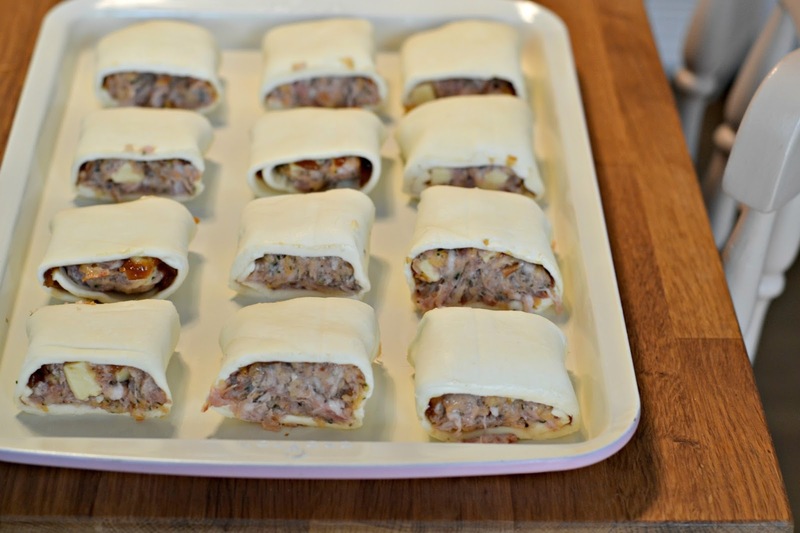 Then, you want to take a sharp, clean knife and divide each sausage roll into six, making 12 snack size sausage rolls, perfect for little ones. You could do larger ones if you prefer, but thats up to you. Tip: I find wiping the knife clean after every cut provides the cleanest and neatest results. I like to use my Marigold Oops Away Roll (RRP £2.99 for roll of 40) for this. It is essentially absorbent, reusable kitchen roll! You just tear off the amount needed, use wet or dry, wash and re-use. Genius. Then, transfer your sausage rolls onto your prepared baking tray. Take your egg, crack into a bowl, whisk together, and give your sausage rolls a light egg wash. This part is optional, but it does make them look lovely! And then it’s into your preheated oven for around 20-30 minutes (oven timings may vary), or until golden brown and oozing cheddar. I take the cooking time as a cue to wash up – it means I have more time to sit an enjoy a sausage roll and a brew when they are done. I suffer with really dry hands, so I like the Marigold Extra Life Kitchen Gloves (RRP £2.50). We always have them in – and Mark won’t wash up without them. It always makes me smile when I walk in and see him with his yellow gloves on. 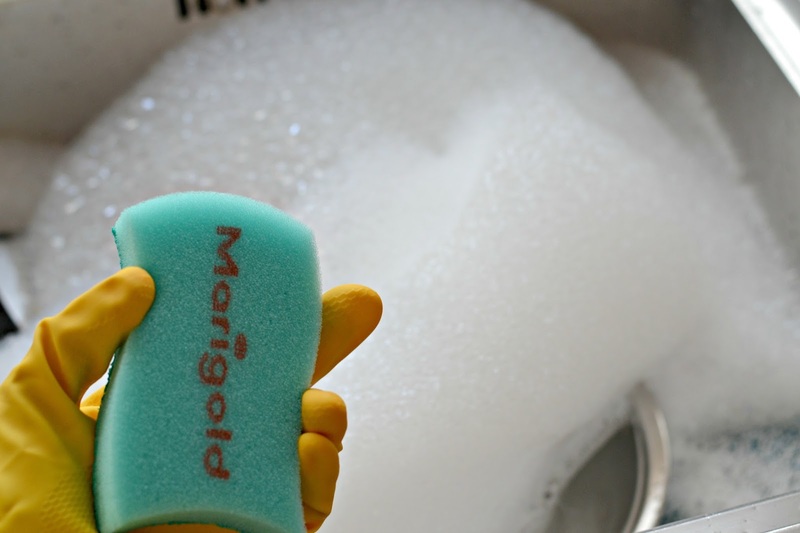 I also love the Marigold Cleaning Me Softly (RRP £1.19) sponges – they remove melted cheese and crusty bits from my oven trays really easily, without damaging the non-stick coating. If you’d like to freeze your sausage rolls, I would lay them out, uncooked, on a baking tray and place in the freezer to freeze. Once solid, you can place into sandwich bags and grab as you need them. Just cook in the oven for an additional ten minutes or so, adding egg wash halfway through cooking time if you’d like to. 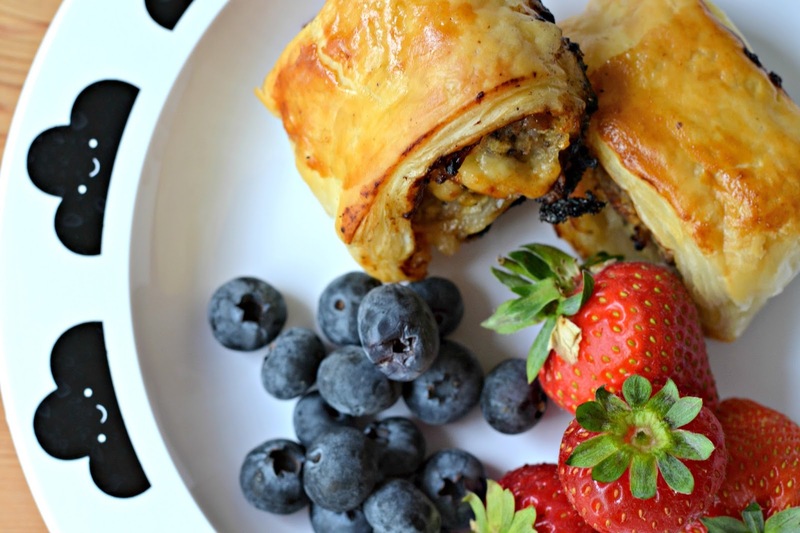 I promise that these sausage rolls are absolutely worth the effort. They are moorish and have hidden fruit, which is always a winner with little ones. Bill loved his for lunch today, along with some fresh fruit, and I felt good knowing he was getting little bits of what he needed to get him through the day. They would be perfect for those days where you don’t feel like making tomorrow’s lunchbox after a long day, and you can just bung a couple in the oven and pop them in and feel like a hero when your kiddos give you a thumbs up. Plus – these would be perfect for Christmas. Pork and apple is perfect for that time of year. And you could even use up some leftover stilton instead of cheddar! *Thank you to Marigold for paring up with me for this recipe and for stocking up my kitchen with some brilliant Marigold products too.